FEBRUARY 18, 2019 – President Paul White announced today that the Rotary Club of Newburg received the 2018-2019 Zone 33 Public Image Citation. The Citation is given to clubs that create a positive public image by building awareness of Rotary in their communities by telling compelling stories about club activities that make a positive difference. The Rotary Club of Newburg is part of District 7530, which is one of 15 Rotary Districts comprising Zone 33. Pictured are: (Left to right) 7530 District Governor, Mike Davidson, Rotary Club of Newburg President, Paul White and District Governor-Elect for the new combined District 7545, Shari Messinger. Club president, Paul White and iPDG David Whalen. OCTOBER 8, 2018 – The Rotary Club of Newburg enjoyed an evening with DG Mike Davidson, iPDG Dave Whalen and DGN Sean Sawyer. iPDG Whalen presented the club with the 2017-18 Rotary Presidential Citation. President Paul White is shown accepting the award from iPDG Whalen. DG Mike Davidson, iPDG Dave Whalen and DGN Sean Sawyer closed out the evening with comments regarding the strength of Rotary in District 7530 and the numerous activities that clubs support. Club president Paul White with District Foundation Chair, David Raese. SEPTEMBER 24, 2018 – Members of the Rotary Club of Newburg enjoyed a visitation from PDG Dave Raese who presented the club with the District 2017-18 Goal Busters Award. This award is presented to the clubs who made or bypassed their Rotary Foundation and Polio Plus Goals they recorded in Rotary Club Central. Exchange Student, Anthony Ludenas, from Peru also attended the meeting with Dave and provided the evening program. Club members enjoyed listening to Anthony speak about Peru and the time he is spending with the Raeses’ in West Virginia. Anthony was presented with a Rotary Club of Newburg Banner to present to his club in Peru. 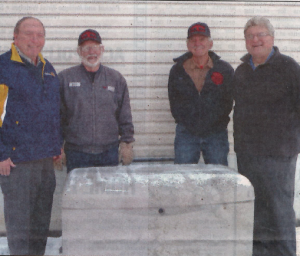 Rotary Club of Newburg President Paul White (left), Newburg Fire Chief Bill Larew, Rotarian and firefighter Tom Willis, and Rotarian and NVFD board member Ed King with the new generator the Rotary obtained for the department. JANUARY 25, 2018 – In small towns across this country, folks tend to wear many hats. So it should come as no surprise that many members of the Rotary Club of Newburg are also associated with the Newburg Volunteer Fire Department (NVFD). The NVFD expressed the need for a generator to aid in offering the fire hall as an emergency shelter in times of need, and Rotary stepped up to help. Firefighter and Rotarian Tom Willis recalled that during the two or so weeks many area residents were without electricity during the aftermath of Hurricane Sandy, the fire hall could provide water and MREs – meals ready to eat – to residents of the area. With the addition of the generator, the department is able to serve as an emergency shelter, with electricity, heat, water and sanitation facilities. The Preston County Health Department is giving the department cots that can be kept on hand for emergencies. King headed up the committee that began seeking grants for a generator: an estimated $10,380 was needed. Newburg is small – 313 people lived in the corporate limits in 2016, according to the U.S. Census – so the Rotary reached out to businesses in the surrounding area and other clubs as well. Greer Industries responded with a $4,000 donation, and Jennings Excavation with $500. The Morgantown Rotary and individual Rotary members gave more than $1,000. The Generators Plus grant program donated $5,000. Other donations bought tnd filled the propane tank that will fuel the generator. The 20 kilowatt generator has been installed and is ready to use. “It’s just really great when everybody comes together,” said Paul White, Rotary Club of Newburg president. Story courtesy of the Dominion Post.